Eagle-eyed visitors will have already noticed we've made a few changes to the homepage and added a couple of new features (both of which are still very much at the beta stage). First (and most obvious) is the new menu bar, which we hope will make finding what you're looking for easier and more logical - and allows us the horizontal space we need for some exciting forthcoming features. We've also added a comprehensive selection of software to our database and introduced a completely new feature, the Link Database. As we start to add more articles about, and reviews of software we decided it would make sense to add a new database category and to build a proper software section on the site. At the moment it covers commercial and (a selection of) free desktop software for Windows and Macintosh operating systems, (mobile apps will follow in the future), but we hope, eventually, to build a powerful resource and reference tool for imaging software on all platforms. Since software is now in our database you can easily add it to your gear list / wish list, write user reviews and compare features between different applications. Click here visit the new software hub. 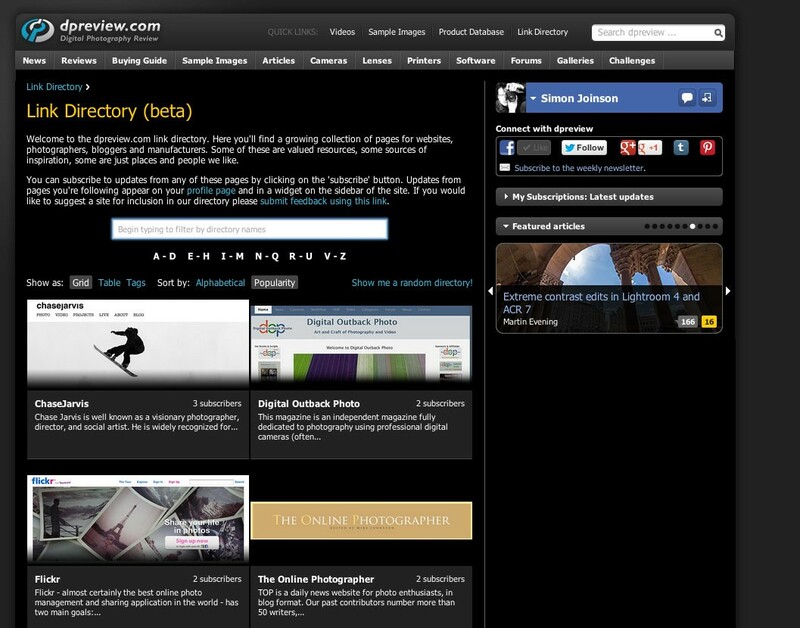 The new link directory is, as the name implies, a directory of web resources for photographers and digital camera fans. In the directory you'll find a growing collection of pages (with RSS and twitter updates) for websites, photographers, bloggers and manufacturers. Some of these are valued resources, some sources of inspiration, some are just places and people we like. Right now there's a fairly limited list of sites in the directory - just enough to give you a taste of what it offers - but rest assured we'll be adding to these pages extensively over the coming months. You can subscribe to updates from any of these pages by clicking on the 'subscribe' button. Updates from pages you're following appear on your profile page and in a widget on the sidebar of the site. If you would like to suggest a site for inclusion in our directory (or claim a page as a site owner/webmaster) please submit feedback using this link. The new links directory page - currently in beta. Updates from sites you subscribe to appear in a sidebar widget on the homepage and on forums. You can also view - and manage - subscriptions - from your profile. That's it for now! There's lots of work still to do, but we're always thinking about ways to expand dpreview and improve the way the site works, and we're excited by some of the possibilities that these changes could open up. Feel free to leave (constructive) feedback in the comments. The reading of the forums (in particular the mft forum) is getting worse and worse, to the point that it makes the reading a frustrating experience. Very often after a long wait, all I get is an error frame. If I click to reload, sometime I get to the message board again, but often I'm back to the error page. Then things begin to go awry. First there is one error message now and then, but as time passes, the situation deteriorates and I get one long wait and error frame more and more frequently. In the end, I leave the forum. I have these same problems both with the iPad on wifi using Safari and with a wired connection on the desktop, using Firefox and Norton 360. When are you going to do an iDevice app for accessing this site? I would like to re-voice the concern about the fact that news appears at the top of the page and then in the middle of the page and then back at the top. Hey with the new features why not a *Like* button in the comments on the forums? Sometimes that's all you need. I have a query about site design. How come the links from your front page, lead to a page that does not have the story, but usually lead to an intermediate page which has a synopsis an image, and a link to the story? E.g. 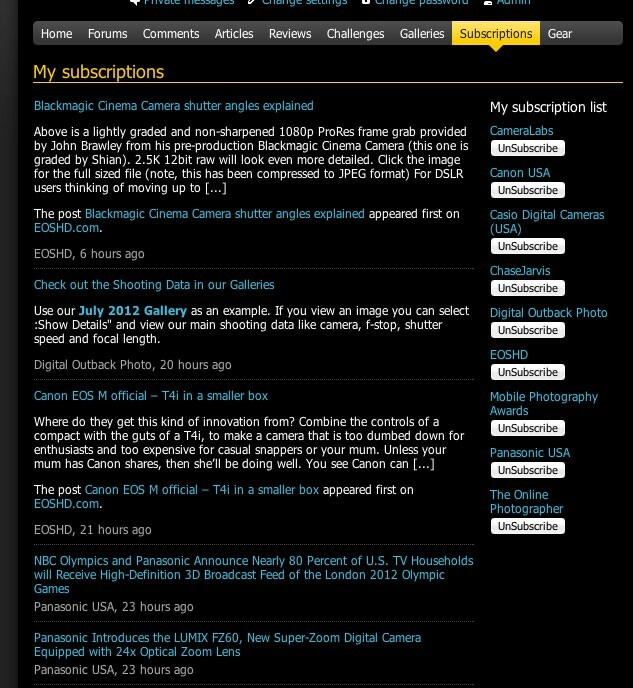 if you click on the "Just Posted: Nikon D3200 in-depth Review" link on the main page it takes you here: http://www.dpreview.com/news/2012/07/26/Nikon-D3200-in-depth-review. That page has a paragraph of text and another link to http://www.dpreview.com/reviews/nikon-d3200 which is the actual story. I find the intermediate page a waste of time - it usually imparts no useful info apart from the link to the real page. Could you not link straight to the main article? I do understand you get an opportunity to present the reader with another set of Amazon links for the product under review, but surely people don't use those links until they've read the article/review. Where you thoughtfully include the amazon links again anyway. Can we please lose the intermediate page? Oh - I do see a case for the intermediate page, when you are liniing to an article off site - then you have no other opportunity to present Amazon links/ads which I understand you have to add. I just don't see the value of adding them *before* an article which is presumably going to tell the reader more about the subject matter and help them make a more informed decision about the subject matter if it is an item that can be purchased. Stop shrinking the horizontal spread of text ... you're making this site harder to read with each passing update. Everything's getting squashed into columns, text now needs magnification to read for any length of time. It used to be much better. Just make the defaults more "medium-sized monitor" friendly. on Linux this site doesn't work good. If I click on "forums"and then I select a certain one, then I get a page with the whole list of forums, and then I have to select once again. Your problem is more likely a browser issue versus operating system issue. The Forums choice at the top of the page works fine for me (I get a drop down list of forums with a "mouse over" and when I click on one, I go directly to the selected forum). I only go to a page that has a list of forums if I click on the Forums Menu choice directly versus using a mouse over and selecting one. I use Firefox in Linux most of the time (and I just tried it with FF 14 and it works fine, but I don't recall having issues in earlier Firefox versions either). I also tried it with both Chrome ( 21.0.1180.57) and Konqueror (older 4.5.3 release) and I don't see any problem like you're reporting. I get a drop down list of forums with a "mouse over" of the Forums menu choice at the top of pages here (like from the page this article is on), and I go directly to the selected forum when I click on one of the choices. What browser are you using? You may want to try a different one. I haven't updated the software on my wife's laptop lately. It's running Mepis 11 (using a Debian Stable base), and it's got Firefox 10.02 on it right this minute (as I just haven't taken the time to update to a newer version in a while). The Forums menu choice works fine with that version of Firefox, too (as I suspected it would). I've also got Opera 11.51 on it (as she likes it), again, not current because I just haven't updated the software on it lately, and it also works fine with the Forums Menu choice here. If you're using some kind of odd browser choice (or an older version that may have issues with newer site features), you may want to try something more mainstream instead, like a recent version of Firefox or Chrome. Rather than spending on new features (which result in font being significantly smaller and harder to read) I would like to see DP spending on making the site more reliable. Maybe removing any flash content for good. Within past 1 hour the shockwave crushed on me twice and I consider stop reading site for the day just for this reason. For the last few days the response time of this site has been all over the map. It frequently goes catatonic (non responsive) for up to minutes at a time. Is this caused by your overhaul, and will response time be back to normal now (no more catatonic episodes)? I have been lobbying a couple years for a new appearance item. The black background with white letter precluded pasting valuable articles into any document like Word. If you try to print something out of DPR it drains your ink cartridge and the page has so much ink on it a clothes dryer is needed. But I guess that is one way of copy protecting info from mere readers of this site for 11 years. After all, we are not to be trusted. this has nothing to do with copy protection (as, perhaps, evidenced by the new 'print view' in many articles). (or just select auto fr both). is it only me or the site is super slooow now? if it is, it's coincidental. There's a definite random 'hang' every now and then......I usually have to hit refresh to get it. It is often very sloooww for me too (using Firefox both on my iPad2 with Wifi and desktop with wired connexion). Very often when the waiting is too long, I get an error page (the one saying that I can send a feedback to DPreview if I want). A karma system on the forums would be great. Galleries were released in Beta mode approx. 2 years ago with the note that a "pro" account would follow - any news? Most likely you've added DPReview to your IE compatibility list. Set the IE mode to default (IE 9 standard) and all should be well. Send us a feedback if you need more information. Good job guys, DPR is looking good. I would like to see like or unlike on forum posts. Link Directory that's cool, i actually submitted this idea about a year ago. 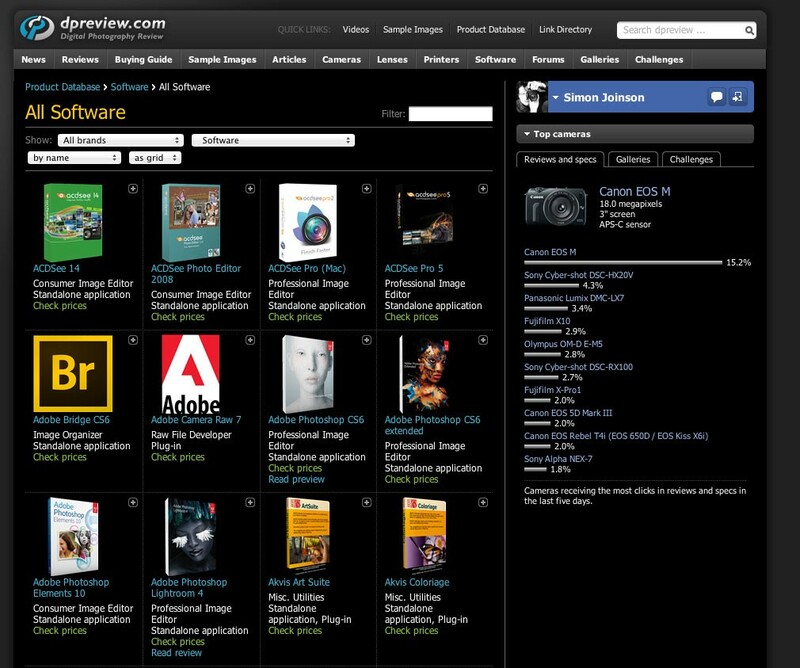 Phase One capture One pro = category consumer image editor. There are a lot more small issues that makes or breaks a raw converter: Colour profiled conversion, batch printing, batch conversion to name a few. But atleast the compare software is a start. As the site grows more and more complex, you may want to have a "lite" version of it. The new changes do not work well on locked-down browsers in corporate environments. I now have a problem accessing the forums. There is a menu down the left hand side. I follow the horizontal bar on my chosen Forum, go down to select a post - but now I get the next forum header. It was not broken before, so why did you fix it? Did you guys change the color of your logo? Personally I like the new one, it's more eye catching. thats great but how about moderated forums? Being able to sticky certain threads would be an awesome addition as well. People aren't always inclined to just read random user-written articles. Despite the complexity of this site, it loads rather quickly. Please keep it that way. We all don't have the latest and greatest computer or multitudes of memory. In fact, I often switch to dpreview to get out of a "spinning" site. Sure wish they'd add a FULLSCREEN buton for the sample images, nothin I hate more than having to resize my browser and click 4 times to see an image !!!!!!!!!!!!!!!!!!!!!!!!!!!!!!!!!!!!!!!!!!!!!!!!!!!!!!!!!!!!!!!!!!!!!!!!!!!!!!!!!!!!!!!!!!!!!!!!!!!!!!!!!!!!!!!!!!!!!!!!!! Sounds like good idea...but, the top level menus and links to gallery images no longer work for me using Firefox 14.0.1. Clicking on the menus works but the mouse-hover doesn't open them menus any more. Hi Rick, try clearing your cache and then restarting your browser, I expect that will resolve the issue you described. I was going to say the same thing. It says "Click here to read our 8-page in depth preview", I click and it says "Click to read our preview". Not a big deal but I have never understood this two-stage process. Well mostly because in a few weeks time when that story has floated off the bottom of the front page news feed it will be primarily accessed from search engines which will come into the news story page. Plus an interstitial page allows us to add more detail, other links, and comments to the front page news story/announcement. @Phil - Sorry, but I don't understand what ou are getting at re people accessing via search engine. I type "Nikon D3 review" into google and the top link takes me direct to the D# review article (i.e. http://www.dpreview.com/reviews/nikond3). It did not take me to one of those interstitial pages. Google knows what I want and takes me straight there. It's only when I navigate from the DP home page I get stifled and annoyed. @Barney - the thing is there is rarely if ever anything useful on the interstitial page no more detail (that I won't see anyway when I click through to the main article itself). It is rare to see extra links. It really serves no apparent purpose to the reader. And as far as I can see only really serves a purpose to DR (i.e. to add buy links/advertisements) when the link is off site - otherwise the ads/buy links can just as well - nay, better - be served on the main article. Couldn't additional useful info (when present) be put it in the article's intro/header? It's very irritating to have to click on a link on the first page, then the next page doesn't give you any more information, and you have to click on another link. e.g. The preview of the new canon mirrorless camera. It seems pretty pointless to me to have to click on two different pages to get to the main page. for this camera. It seems to serve no real function to have to do this. It serves to allow more advertisements, aka not the user ! I like the no-advertisements look. When are we going to be able to turn off the black background? Seriously, I spend alot less time on this site than I would otherwise because the excessively high-contrast layout is so fatiguing to read. The contrast is the same (black on white vs white on black), but I prefer reading white on black background because it is a lot less bright. i hope we will have this option in 2013. It's a huge job, but we have had some success in automating the process. The eye works a bit like a camera on AE with average metering mode. Looking at a predominantly black page with some white text opens the pupil, which in turn reduces the acuity of my vision (OK, I need reading glasses too). A predominantly white page with black text is easier for me to read because it looks sharper with my stopped-down pupil. An option for black vs white background would be helpful. There is a misleading link to "top compact cameras" but they are just what people are looking at not necessarily the top compact camera. Popular is probably a much more accurate term. I say don't fix what isn't broken and keep things simple. I've been using and enjoying dpreview for over 10 years now. Focus on reviewing more cameras with the goal being ALL cameras having studio samples for side by side comparison. As regards reviews, as I said in the first comment on this thread, these site changes are developer-driven, so didn't impact on the production of the site's core content. We're actually reviewing more cameras than ever before right now but obviously there's a lot more we want to do. Use the dropdown to select 'rating'. It's not very attractive (for now), but the information is there, if that's how you like to sort the content. I wish you put voting system in the forum so you can really filters the idiots. We've got some really exciting developments coming re: forums. Scott, we have been waiting patiently :) I do hope the sandbaggers gets banned this time! We keep our fingers cross. Thank you. I honestly think the forum can be a great great thing for the community. Lack of controls causing such pain dealing with total amateurs, extremely arrogant professionals and unnecessary foul languanges. Improved search system, and who is still using anything other than flat view in forum? Voting system like reddit would be great. And also get rid of the baby's that find it too difficult to interact with other human beings in a grown up manor. Your site does not work in IE9. How can I send a screen shot of the jumbled mess I see? What parts of the site don't work in IE9? We test against all current and recent older version of IE, Chrome, Firefox, and Safari. The new menu stacks up vertically on the left and is rendered virtually unclickable. I'm happy to send a screen shot, as I mentioned. I also sent a mail via the feedback link with my e-mail address. That appears to be a legacy issue with IE7. Press F12 in IE9 to bring up the HTML inspector and double-check your browser mode is set to IE9 and document mode to IE9 standards. Actually, if you have IE9 set to compatability mode, it won't work. If you go to "regular" IE9 it's okay. You can add one line of code to fix that. Fixed that. Thanks for pointing this out. Since you're adding rumors sites as well, do not forget Sony Alpha Rumors. I just wish you spent more resources on writing reviews. That is what made your site great. I fail to understand the lack of reviews done when it really matters, like as soon after a camera's release. We write previews with enough original content that they'd count as full reviews on most other sites, usually on the day of launch. It can take a while to get hold of final camera samples for review (we never review anything that isn't final production quality with shipping firmware), and it can easily take 4-5 weeks per major DSLR/ILC to write a full review. Given how small a team we are, we put a lot of content out, and we're actually on track to publish more reviews in 2012 than ever before. Read the first comment below. Unfortunately, due to the nature of our reviews, in that they include technical tests that are more in depth than other sites doing reviews, publishing a review just after a camera launch is nearly impossible. We're always looking for ways to cut down on that time though (without hurting the accuracy of our findings), and will continue to do so. I'd rather wait for the "real thing." Not interested in a rush to judgment. I think you can also be more selective (as in the past) as to whether a camera gets reviewed. I think it must be significant to that camera line or the marketplace. Not doing previews would be very silly. Not only because we'd be throwing traffic away, but since they represent the first 20-25% of a review, we'd still have to do the work anyway, later. Thanks for everything you guys do. The previews answer 90% of my questions without having to read through the press releases. I do like your infrequent technique articles and wish there were more. Not covering basics so much as qurirky stuff. An example is an article that just went up on Luminous Landscape on Landscape Astrophotography. Never heard of it and now I'm itching to try it. That sort of feature is cool and inspirational. I often read on my phone and do like the mobile version pretty well, though I wish the comparison tool worked better. It works much of the time. I'm sure you'll be getting more mobile readers, so it would be nice to have all the major features working. Many have said they'd like more group comparisons, and so would I. Lots of work, I know, but maybe when this year's floodwaters subside, you can find some way. They are highly useful. I completely agree. These are all things we're aiming for in Q3/4. I appreciate the balancing act on timely reviews, and (on balance) am happy to wait for a considered view rather than a rush to get it out. Except... when a manufacturer offers a time-limited incentive at launch, like Olympus with their free grip on the OM-D E-M5. I was *desperate* to read your review before time ran out (smile)! What about something really sensible like lens reviews? Another vote for lens reviews. What we do notice is that the site is frequently a mess, giving constant error messages. Obviously, some competent and EXPERIENCED IT people should be hired. It was much better in the old days. And, no, it isn't amusing at all. Perhaps you could do a pre-emptive strike at whoever is responsible. How does this count as constructive feedback on new site features? However, I like the new Software database utility. I'm gobsmacked by the complainers on these forums. We readers are basically getting a free camera magazine, a dang good one too. Be grateful. Be happy. $100 an hour. I guarantee that your site, database and otherwise IT performance will improve drastically. By the way, I am worth it, every dime of it and I work out of my house but, I am willing to travel for short periods. In other words, I am the solution to your problems. I'm also a photographer - ex pro. I'm using an older version of Firefox (calling itself 4.0.1) plus several ad-blockers on 2 machines with Win 7 and Win XP resp, and DPR works very fine all the time. Nope, these site changes were developer-driven. New lens reviews are on their way very soon. Did you guys change your logo to more of a teal color from blue? It does not work on older computers. The menus now appear behind the images on the top of the page. I like the fact that the ads are gone but I cannot use the menus at all. Why can't people leave well enough alone when it works? Howard - what browser are you using? @mssimo Whoa, I just noticed that. That's weird...the logo in the upper left of the website is teal, but everything else is still blue- employers' icons in the forum/comments, the icon in the tabs, etc. DPReview is hiring for two Editorial Writers!